PomoDone is a free Pomodoro timer software. Like many other similar websites and software, it follows the traditional Pomodoro technique and helps to divide your task into intervals, along with short and long breaks. 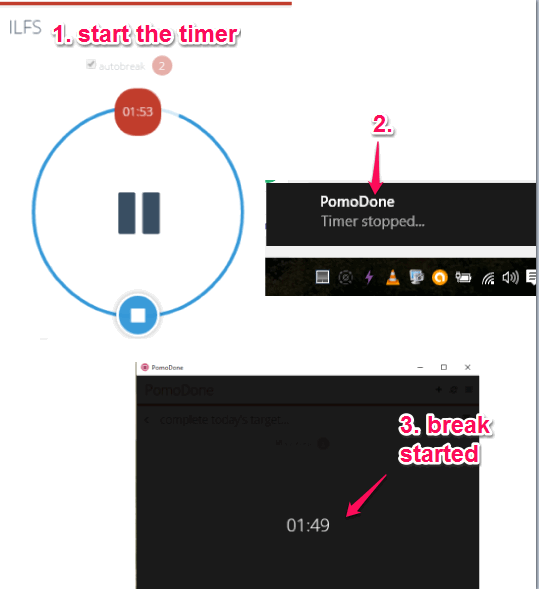 But this is not what makes this software unique, as it’s the common feature of any Pomodoro timer software. The special feature that comes with this Pomodoro timer is its integration with other task management services. 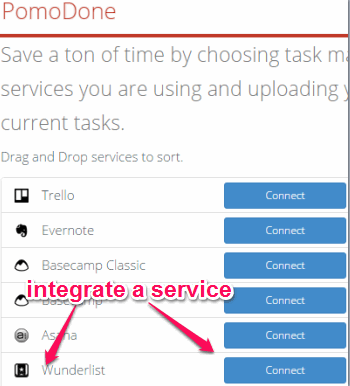 For example, you will be able to integrate your Evernote, Trello, Wunderlist, Todoist, Basecamp, and Asana accounts to import tasks on its interface. After this, you can use the Pomodoro technique using this software to complete the imported tasks. 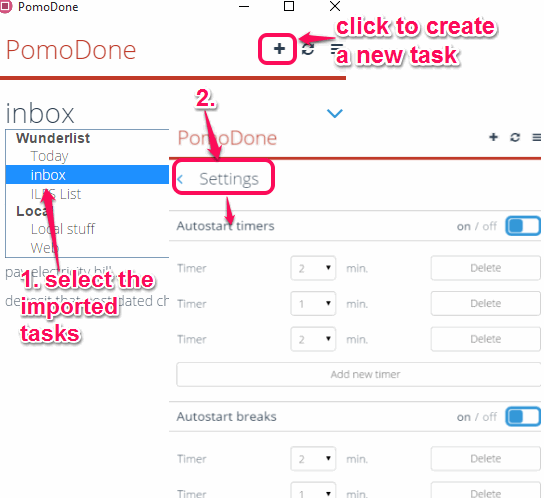 This combination of Pomodoro technique with task management services will result in improved productivity for sure. 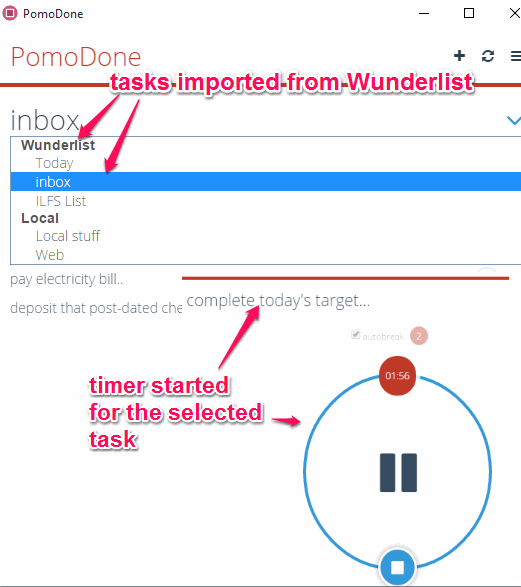 In the screenshot above, you can see the interface of this free Pomodoro timer software and list of the tasks of my Wunderlist account. You can use this software by creating a free account and use its desktop app to add new tasks. Using its web interface, you can integrate or connect other task management services and those tasks will appear on its desktop app. To complete a task, you can use multiple timers and breaks. The only motto is to remain focused and complete the tasks. Note: PomoDone is also available for Mac and as a Chrome extension. Here is the link of its homepage from where you can grab the setup. Install it and launch the UI. Now you have to register for a free account. Now open the web interface and sign in with your login credentials. After this, it will prompt you to connect with any of the supported task management services like Wunderlist, Trello, Evernote, etc. 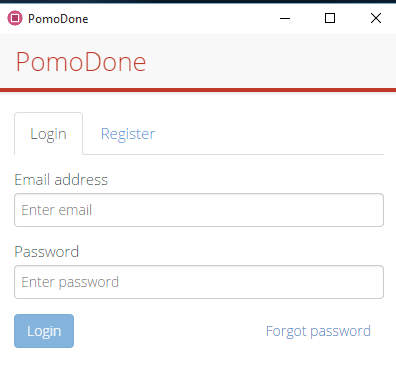 You can use any supported service to integrate your account with PomoDone and select the tasks that you want to import. After this, you can go back to the desktop app and use the drop down menu on its interface to see the imported tasks. Select any task that you want to complete and start the timer with default time. However, it would be really good if you set the number of timers and breaks of custom length. For that, you can use Settings. When you have set everything, you can start the timer. When the very first timer will stop, it will show a pop-up notification and start the first break. After completing the break, working timer will start with another timer so that you can get back to work to complete the task. In this way, the cycle continues till you complete your task. 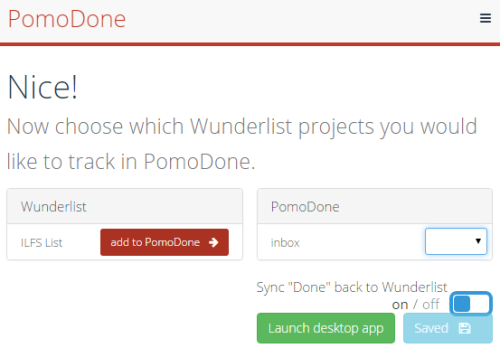 PomoDone is a great Pomodoro timer software and it has taken the task management process to a new level. However, the feature that I missed in this software is that you can’t use its desktop app to integrate the task management services. You have to use web interface. Overall it’s really good software. Everything is just fantastic and its features are really great.